As we drove from Zurich to Interlaken, Switzerland's countryside impressed us; it's like Lake Tahoe on steroids. The beautiful scenery compensates for a lack of music. We only have two tapes: Abba's Greatest Hits and a 80's mix of various artists. One radio station is good and technologically advanced - along with the songs it electronically transmits the artist/title which appears on the radio's tuner display. Another driving note: the yellow light is shown before green (the green light flashes before turning red), which makes every traffic light feel like the beginning of a drag race. Drivers in Switzerland actually stop for pedestrians, even in major cities. Finally, our compass doesn't work in a Renault car, but we've never had any problems in a Volkswagon. Ever since Africa we're hooked on navigating by compass. Since we had already left our hotel, Jill had to shop with a backpack full of clothes. Where are the grocery baggers when you really need them? Changing to Swiss time. 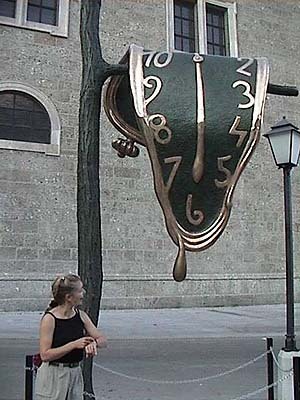 Or is it Dali time?